(Quantities reflect iventory of 28 FEB 2012.
ranging from 150 kHz to 1500 kHz. Purchase buttons are coming soon! Several crystals now available - see order secion below with pricing. During WWII these quartz crystals were manufactured for use in military vehicle radios. in the 20 - 40 mhz range, but the fundamental frequencies are much lower. Notes FT-241 crystals, black body, were used in the BC-604 with a working frequency 20-27.9 MHz, 80 "channels" numbered 0-79. Their fundamental frequency is 370.370 - 516.666 kHz, to be multiplied by 54. The 1/2 inch Pin spacing and diameter is identical to FT243 types. FT-241 crystals, brown body, were used in the BC-684 with a working frequency 27-38.9 MHz, 120 "channels" numbered 270-389. Their fundamental frequency is 375.000 - 540.277 kHz, to be multiplied by 72. These crystals have a very interesting fundamental frequency range to compose sharp I.F. filters around 450-475 kHz. 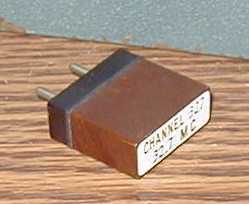 Example: Channel 68 = 496.3 kHz. CLICK HERE for CALCULATOR - thanks, Fritz! E-mail me to inquire or purchase these. Click here. I will post more here soon. use in FT243 holders. Supplied with the metal electrode plates. These are a nice mix from about 1000 kHz up to 8500 kHz. I will sell the whole bunch for $15.00 plus $5.00 for USA Shipping. Contact plates are also available; Quantity 100 for $5.00 plus shipping Inquire by e-mail. Click here. FT243 springs are also available; Quantity 100 for $5.00 plus shipping Inquire by e-mail. Click here. Phenolic insulators are also available; Quantity 100 for $5.00 plus shipping Inquire by e-mail. Click here. 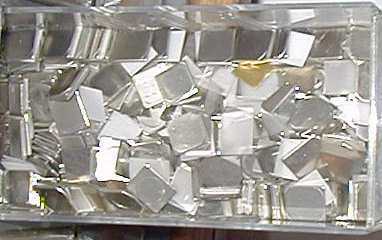 Copper, tin and brass electrodes (mixed) are also available; Quantity 100 for $5.00 plus shipping Inquire by e-mail. Click here. 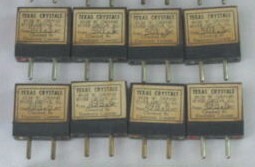 DC34 (BC669) CRYSTALS - CLICK HERE FOR LIST. FT243 CRYSTALS - CLICK HERE FOR LIST. 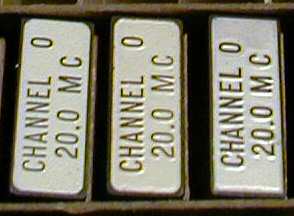 8 MHz FT243 CRYSTALS - CLICK HERE FOR LIST. AM Broadcast Band FT243 CRYSTALS - CLICK HERE FOR LIST. HC49U CRYSTALS - CLICK HERE FOR LIST. Add shipping costs to all prices!